Freshly Squeezed Reviews: Play Ball! If you’re a rabid fan of the American Pastime (baseball was the original one, now it’s sending Instagrams) you’re no doubt familiar with the MLB.com At Bat. By the time you read this, the 2015 edition celebrates the service’s 13th year. No doubt, baseball fans know this already but possibly not cord cutters. MLB.TV comes in two flavors: Basic ($109.99 yearly, $19.99 monthly) or Premium service ($129.99 yearly, $24.99 monthly). Also included in your subscription is the All Star Game and the World Series. Both packages allow for all of the games to be streamed in HD Quality. The Basic service includes features such as LIVE Game DVR Controls (enabling you to create your own instant replay), full game archives, mosaic view (PiP, Split Screen, Quad) and a whole host of others. 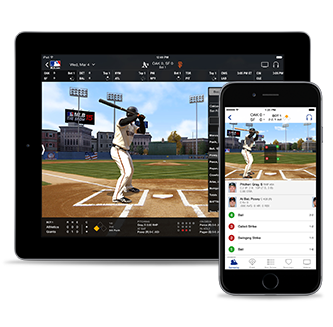 MLB.TV Premium is also subject to the same Blackout provision as with the Basic service, but provides you with a choice of Home or Away feeds. And all games are available to you on a multitude of devices including Xbox 360 / Xbox One, PlayStation®3 / PlayStation®4, Apple TV, WD TV, Roku, LG, Panasonic, Samsung, Sony, Windows 8, Amazon Fire TV, Chromecast, and more. The Premium service includes the At Bat app, allowing you to watch games on your mobile devices, also. This year there are several new features. 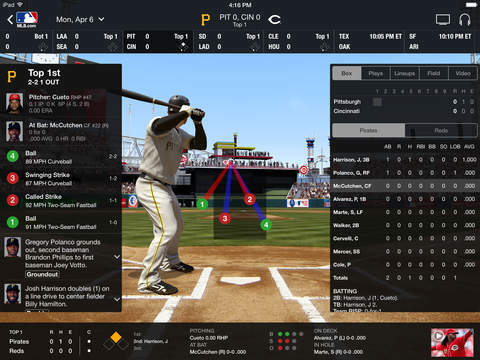 You have the ability to overlay the home or away team’s radio broadcast over the live video or use the “Park” option to include the ballpark’s natural sounds (away team audio overlay is only available to MLB.TV Premium subscribers). There’s the Pitch by Pitch Widget, which allows you to track the location, type and speed of every pitch in real time. There’s Fantasy Player Tracker available to both MLB.TV and MLB.TV Premium subscribers (available online only). “Customize a list to feature entire fantasy rosters and receive on-deck notifications to watch live look-ins for each player. Simply click the alert and watch the at-bat live in a Picture in Picture window.” Definitely for the die hards! There’s Gameday Audio, which is the radio feed which is perfect for listening through your car’s radio. And most impressive, I think, is the ability to overlay the Spanish-language audio feed (where available). I’ve been using At Bat for several years now. It allows me to watch my N.Y. Yankees, as I no longer live in an area where I can receive their games via cable. Now I don’t have to wait for the occasional national feed. If they’re playing, I can watch them. Unfortunately, my experience has been a bit bumpy this year. I paid for the Premium Service and receive my streams on my AppleTV and mobile devices. Or so I should. So far this year, I have been able to pick up all of Spring Training’s games through my AppleTV channel. But for some reason, I was two games into the season and then lost the ability to receive the games via AppleTV. Because I have the ability to watch the games on my mobile devices with At Bat, I was able to shoot them over to my AppleTV and still catch the games. My first thought was that something was acting up with my Wi-Fi. Yet I was picking up the games on my mobile devices usIng the same set up. Even stranger though was the night that I shut down the app on my iPhone in order to use another app. When I relaunched At Bat, only several minutes later, it said that I was located in a restricted area and could not receive the stream. Yet, I had just been viewing the game using the same device in the same location on the same feed! I had a minor problem once before. But once again, I contacted MLB technical support, had a human on the phone within several minutes and they were able to straighten out the problem with no hassle. A very pleasant exception to the usual workflow from normal app support (submit a form, receive a generated email acknowledgment, followed by an email from a tech inquiring about your issue, and so on and so on and so on …). So, if baseball is your game, either for the love it or the enjoyment of playing in the fantasy league, this is a package that is well worth the money. It’s a quality app with quality support for following a quality sport. By all means, purchase it.